Ever since I was a little girl, bananas have been my favorite fruit. I absolutely love them. As a kid, my mum would sometimes make stewed bananas or banana fritters for us once in a while, which I absolutely loved. Besides that, we only ate it straight or in a fruit salad or with jelly. When I took up my first job at Standard Chartered Bank, I used to work with this girl Deepti; I wonder what shes upto these days? but she had once brought a bar of banana cake to work. With the first delicious bite, I was smitten. I used to search high and low in every cake shop for this cake, but never found it. Later in life, when I started baking, with a little research I started making my own and was very pleased with myself. A few months ago, I made some banana bread, a slightly healthier version than regular cake, and had great results with it. Pleased with what I had made in the past, I had no idea about what I was missing out on till yesterday. What happened yesterday? I decided to try making some Bananas Foster and, I was thrilled to pieces with this treat. I know a lot of you are thinking, this is such a simple thing to put together, no biggie, whats she raving about? I don't know about you, but for me, sometimes, the simplest things are the tastiest, and I never miss a chance to appreciate these simple wonders. Bananas Foster has got to be one of the simplest desserts I've come across. I don't know why I've never tried it before, but I sure am glad to have this in my arsenal. I did a little searching on the web, and ultimately I had a rough idea what this dish was about. I just winged the rest of it and it worked out fine. I had a couple of plantains (I love plantains, probably a little more than the regular bananas) that were a little past their prime. This was what got me searching for ways to use them up. I cut them in half lenghtwise, and across, which got me 4 pieces per plantain. It took me about 5 minutes to stew them up and I served these up with some chocolate ice cream. That's it; easy peasy! I know most folks serve it up with vanilla ice cream, but chocolate is all I had and it went really well the stewed plantains. I love the play of warm plaintains and the cold ice cream, with just a hint of rum and cinnamon from the sauce coming through. There is such an explosion of flavor in every single bite. I know for a fact I'm going to make this more than once in a while. I hope you try this out, if you haven't already. You'll be glad you did. Gently warm the butter in a frying pan to melt it. As it melts, add the brown sugar and still to dissolve thoroughly. Place the cut plantains / bananas in the sauce and let it stew for a couple of minutes on each side, till is gets a nice caramelized look. Sprinkle some cinnamon powder over it and gently flip them over. Carefully pour in the rum and stir it in a bit. Very carefully slightly tilt the pan so that the sauce reaches the edge of the pan and makes contact with the flame to ignite. Again, please be very careful with this step. Let the flame do its thing as the alcohol burns up leaving behind the most amazing flavor. The flame will go off on its own. Once that happens, if your sauce is still very fluid, let it cook off for a few minutes till it thickens to the desired consistency. Place ice cream in bowls to serve and place the hot plantains on the ice cream. Drizzle some of the sauce from the pan over it. Serve quickly. Make sure you plate and serve while the plantains / bananas are still hot. Agree with you totally....Simple dishes are sometimes the most satisfying & tastiest!! And nice to meet another banana lover!!! I adore this fruit too & have them daily, sometimes up to 3-4..This recipe is yet another way to enjoy this wonder fruit!! 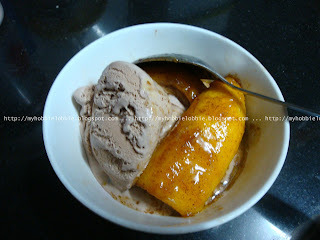 Banana foster looks delicious, thanks for sharing with Hearth and soul blog hop. Thank you Alpana, Rochelle, Prathima and Swathi! Your Bananas Foster look delicious, sure wish I could have some right now. Thank you so much for sharing with Full Plate Thursday and have a great week! I wholeheartedly agree that often the simplest things are the best. I've only recently developed a passion for all types of banana desserts, but Bananas Foster has always been a favorite. Mmmm...yours sounds absolutely divine!